If you want a high-riding belt holster, that's exactly what the Cloak Slide CZ 75D PCR OWB Holster is designed to do. This holster rides high on the belt and tight to the body. This lets you wear it loud and proud if so desired, or with a little layering, conceal while carrying outside the waistband. The durable leather base is available in black or brown leather, whichever may be your preference. Or get both and accessorize with your wardrobe! The leather base is made from tough 12-oz leather, which is plush for comfort but also durable for a long service life. The belt loops can be loosened or tightened as you desire. Set them tight or keep them a little loose for easy on/easy off applications, as the holster can be made to easily come on and off the belt if so desired. Or keep them as tight as possible for an uber-secure all day carry. To the holster base is attached a custom-molded holster shell, made for the CZ 75D PCR and the PCR alone. This gives you the kind of fitment needed for a secure carry. 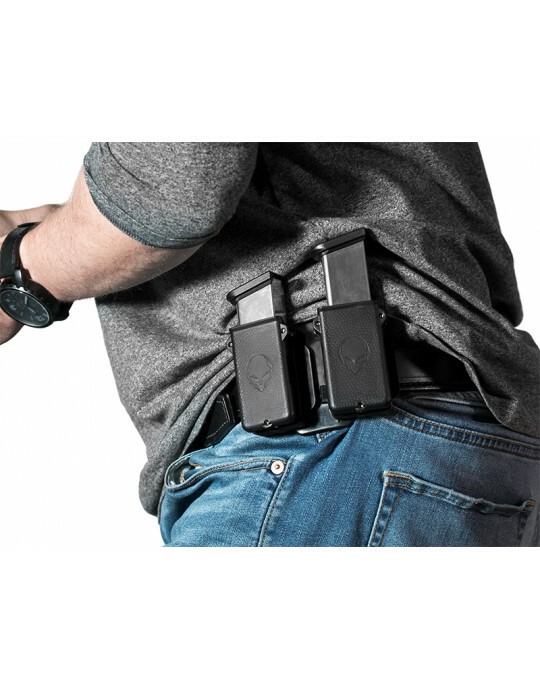 Passive retention is fully adjustable, so you can dial in the holster to hold as securely as you want it to. We also give you a parts pack with your holster, which lets you further customize the fit. Instead of just taking it as it comes from the factory, customize your CZ 75D PCR OWB! You get the freedom to do that, so you can set the holster as you want it to be. You also get Alien Gear Holsters' Iron-Clad Guarantee, a comprehensive product guarantee on the holster. You get a 30 Day Test Drive trial period to start with and our Forever Warranty for the lifetime of your CZ 75D PCR OWB holster. We'll even trade retention shells with you for life. If you ever trade in your gun, you can send us your old retention shell and we'll send you one for your new pistol so you can keep using the holster. Discover a better carry and start your Test Drive today!